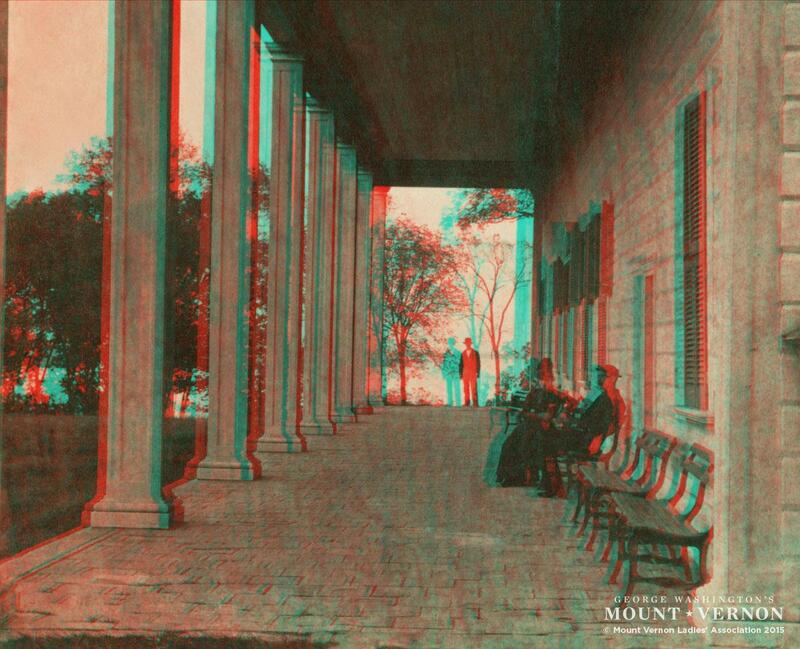 Step back in time for a glimpse of Mount Vernon as it appeared in the 19th and early 20th centuries. 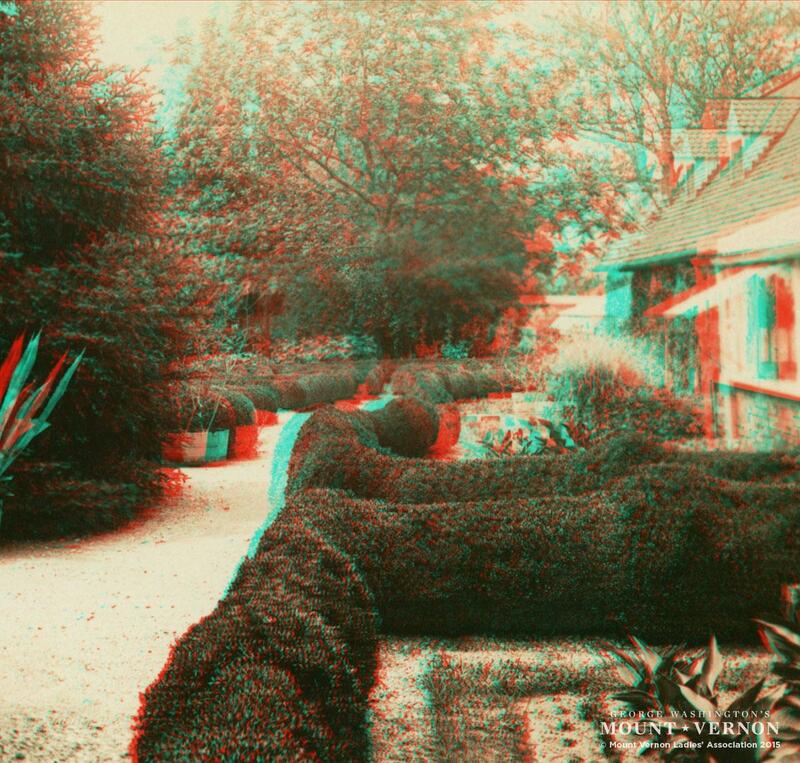 We have recreated these historic views by digitally scanning original Mount Vernon stereoview cards and overlaying them as modern 3-D images called anaglyphs. This photographic technique originated in the 1840s and was popular until the 1930s, when movies and other modern media took center stage. 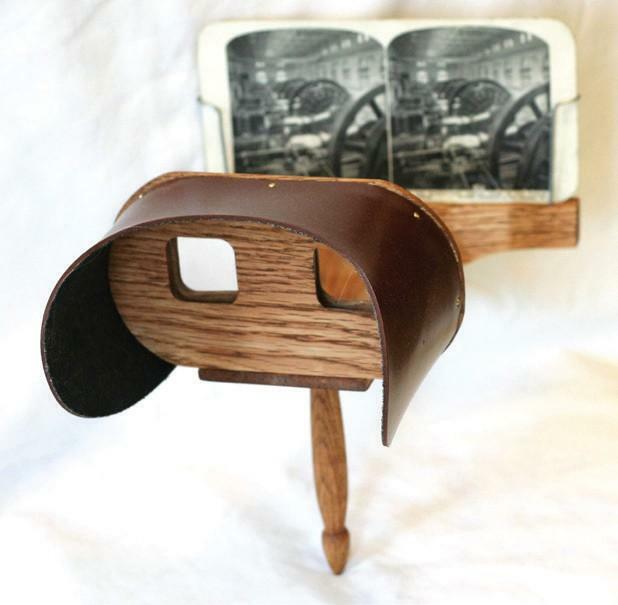 In the late 19th century, looking at stereoviews of famous and faraway landmarks was a popular pastime. NOTE: the date range next to the photographer credit reflects their time of employment with the Mount Vernon Ladies Association. With rooms “adopted” by Vice Regents representing their home states, in this case New York, there was not yet a cohesive interpretation of the Washingtons’ residence. As the largest room in the house, the New Room became a defacto museum. Note the large Rembrandt Peale portrait, and the model of the Bastille, now in the Education Center. 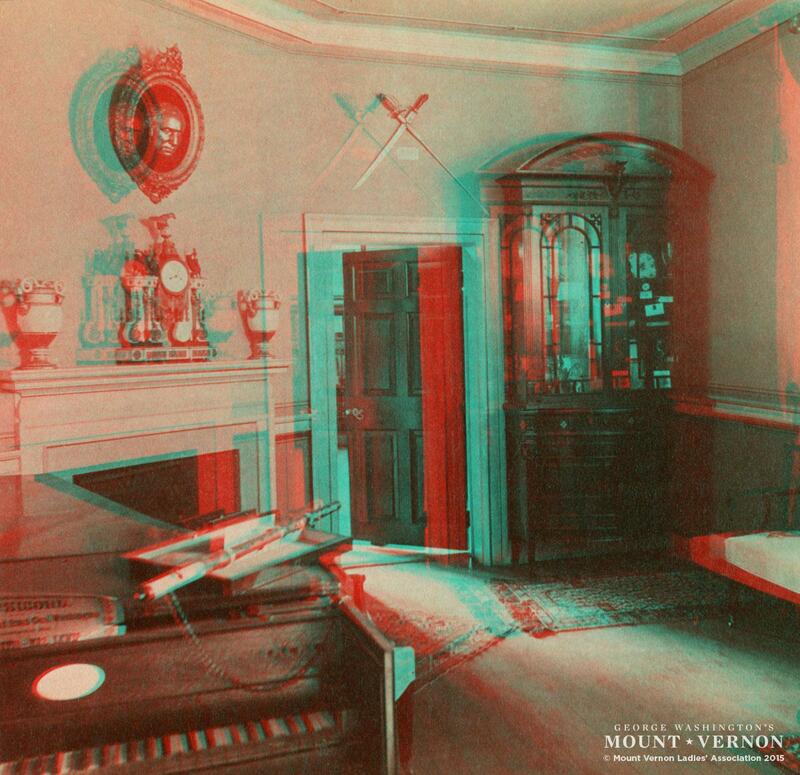 In 1859, the harpsichord became the first Washington artifact returned to Mount Vernon. Note the flute chained to the instrument. The Association had continual worries that guests, allowed to enter certain rooms, would try to break or steal pieces of the building or furniture for mementos. By the 1880s, gates were added to the doors and guards were posted in the house. 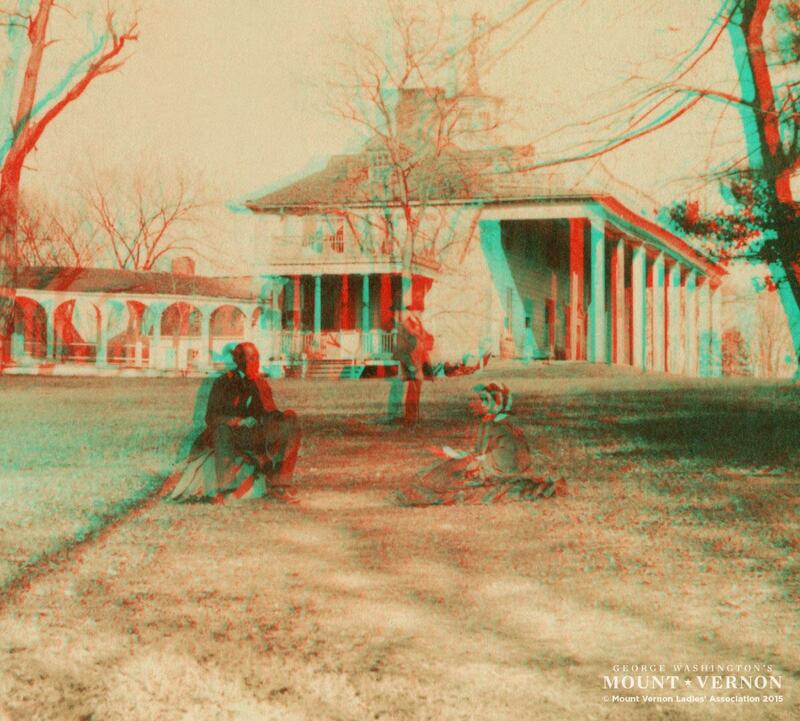 This west front image of the Mansion, nearly 140 years old, bears a striking resemblance to the beautiful vista across the Bowling Green today. Fencing around the Mansion Circle’s oval lawn remained in one form or another throughout the 19th century. While posts and chains disappeared for a period, posts happen to appear in place in photos as early as the 1860s. What is seen in this image are hitching posts on either side of the Mansion circle. Mount Vernon was one of the most famous buildings in North America in the decades both during and after George Washington’s lifetime. With few significant public edifices in the new republic, it served as more than the home of the Washington family; just as Washington represented the nation, so did his house. 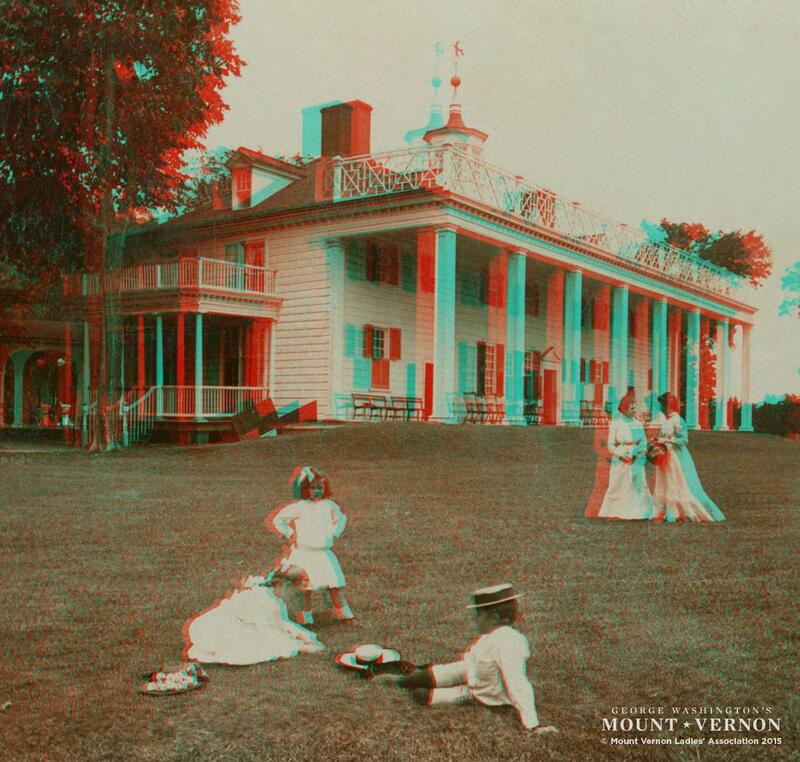 Although some Americans visited Mount Vernon to see it firsthand in the late eighteenth and early nineteenth centuries, most came to know it through inexpensive and easily acquired printed images. When the Association took possession of the property, the greenhouse, constructed by Washington, had already fallen victim to fire in 1835. Funds needed to continue preservation efforts were raised by the sale of plants cultivated in a reconstructed greenhouse in this location, built in 1869, for the purpose of selling these plants. The greenhouse and Upper Garden returned to their 18th-century layout in 2011, after extensive research and archaeological investigation. 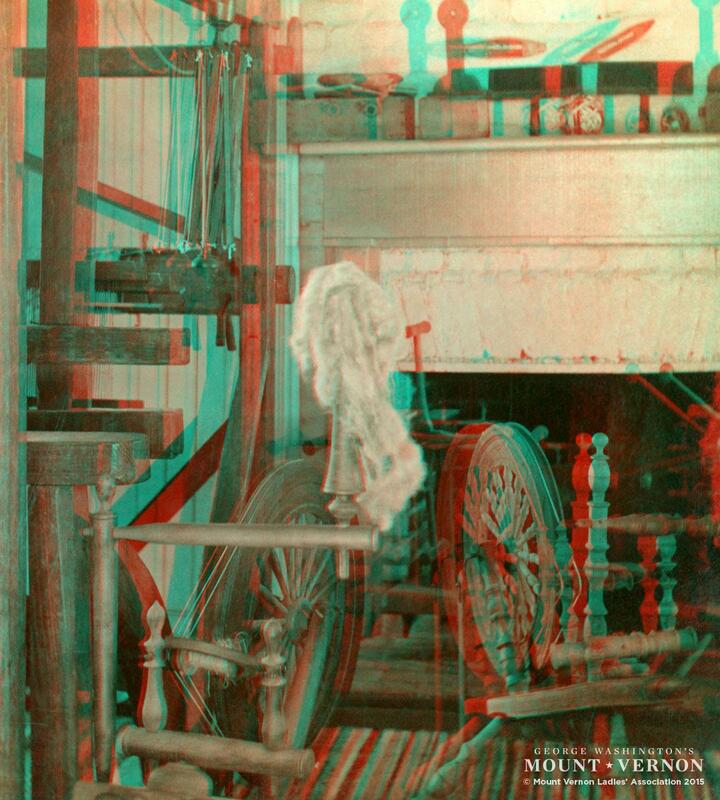 The spinning wheels shown in this image were acquired by the Association in 1892. Placing the spinning wheels, along with the loom, here in 1894 returned the space to its intended use. The fireplace in this room, a 19th-century addition, was removed in 1952. The latest view of the piazza, also called the portico, showing single-tiered shutters on the east side was an 1818 sketch by the Baroness de Neuville. Split shutters are first shown in an 1834 painting by John Gadsby Chapman. These place the change from single- to double-tiered shutters sometime between those years. Benjamin Henry Latrobe’s 1796 sketch of the Washington family on the piazza showed panel shutters on the first floor and no shutters on the second. Shutter types and placement were restored, based upon his depiction, in 2003. 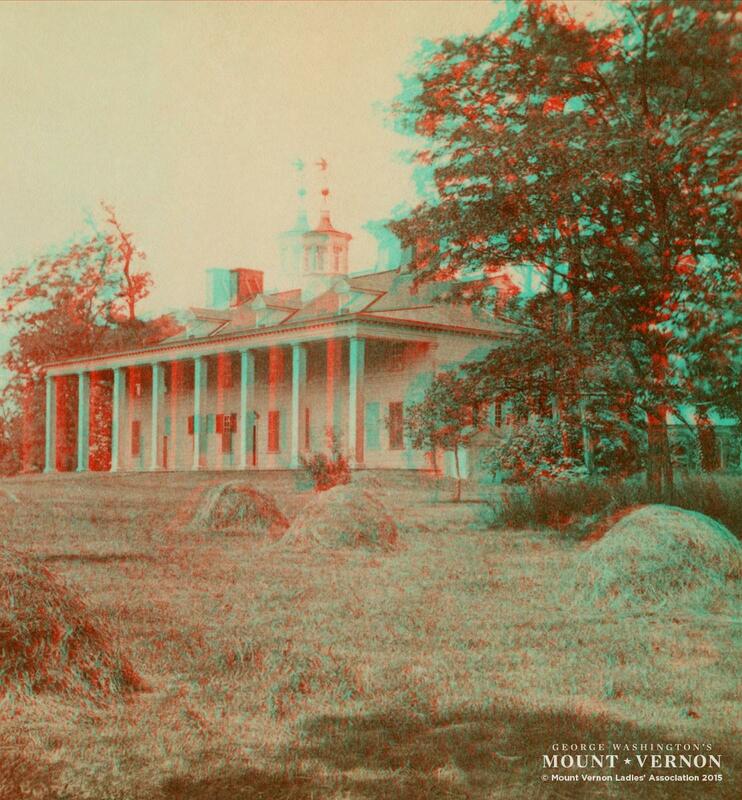 The haystacks in the foreground serve as a reminder that Mount Vernon remained an active farm from George Washington’s lifetime until the early 20th century. Ladders leaning on the chimneys provided ready access for maintenance and fire prevention. The south porch and balustrade, constructed by Bushrod Washington, George Washington’s nephew, was removed in 1932. The pecan tree, just out of view to the left, also from the 19th century, was removed in 2014 to protect the Mansion from possible damage. 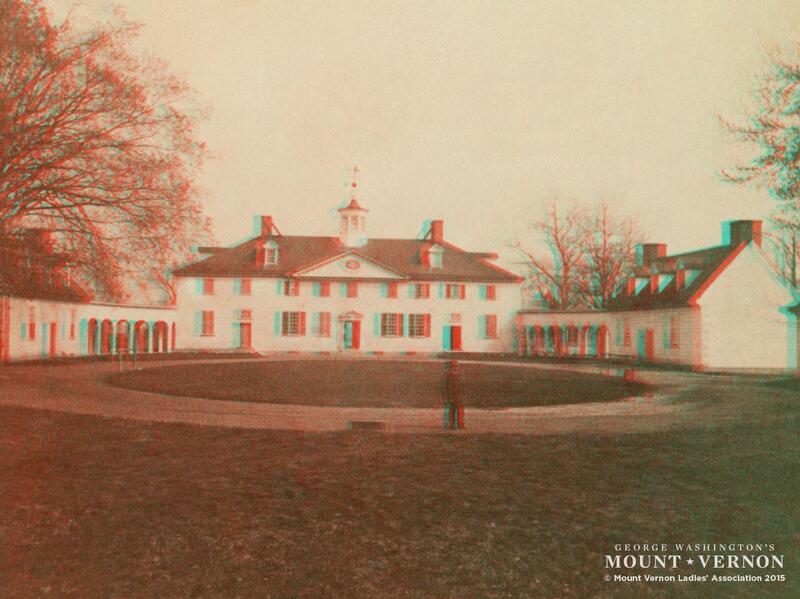 In the early years of ownership, the Mount Vernon Ladies’ Association prioritized the piazza as needing immediate repair. In 1859, several of the piazza columns were replaced. As you look at the piazza, you will see a few remaining ship masts holding up the roof. In 1860, the old piazza roof was pulled down and a new one put up. The kitchen was a bustling space during the Washingtons’ residence, with enslaved cooks preparing meals for hundreds of visitors. 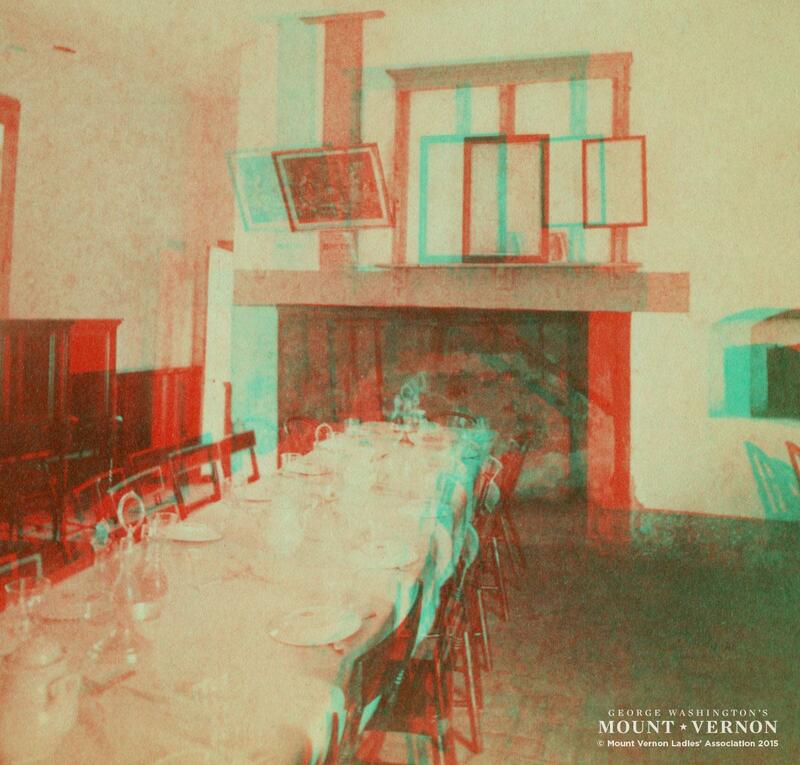 The room continued to serve as a lunchroom for staff and also guests into the 1920s. The wooden wainscoting visible to the left was a 19th-century addition to this room. The brick stable was built for George Washington in 1782-1783, replacing an earlier wooden stable that burned in 1781. The newer structure remained in use until 1924, and was restored in 1948. Notice two cupolas along the roofline, which do not exist today. In this northward view, the most striking difference from today is the corncrib, where the coach house now stands. The Washingtons’ coach house was reported to have been demolished between 1855-1858, and was completely rebuilt in 1894 using traces of the old brick foundation and descriptions of some who remembered the old structure. A second doorway on the south side of the kitchen provided access to the west rooms of the kitchen. In 1859, the Association prioritized repairs to the Old Tomb noting, “Everything is so neglected, and so shockingly careless, the old Tomb is being carried away piece meal, we want a railing around it, and a guard who will permit no further pillage.” The white fencing seen here was replaced with wrought iron railing around 1886. While owner of Mount Vernon, John A. Washington III had plank pathways laid around 1850. In 1859, plaster repairs were made to the Tomb, and by the end of 1860, a new plank road and pedestrian path leading from the wharf to the family vault had been completed. 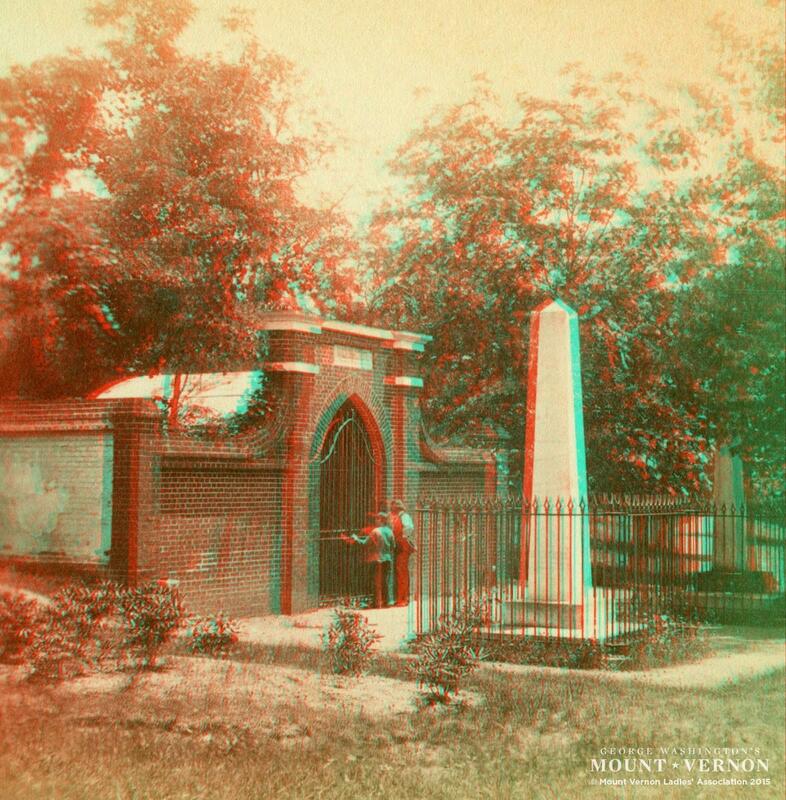 In 1849-1850, the Washington family erected two new monuments at the family vault, in memory of those Washington family who inherited Mount Vernon. A wrought iron railing enclosed each monument. 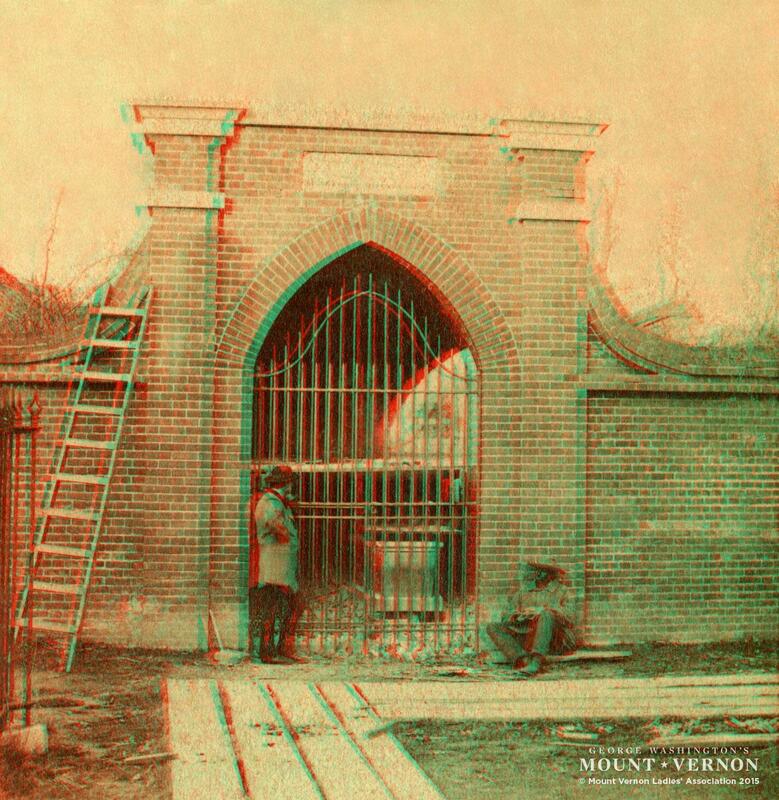 A sentry box or guard house added at the New Tomb in 1892 provided security. With many visitors arriving by boat, revering Washington’s tomb as sacred ground, continual improvements were made on pathways connecting the wharf to the New Tomb. A brick courtyard was laid in 1885-1886 and many paths were replaced with brick in 1902. 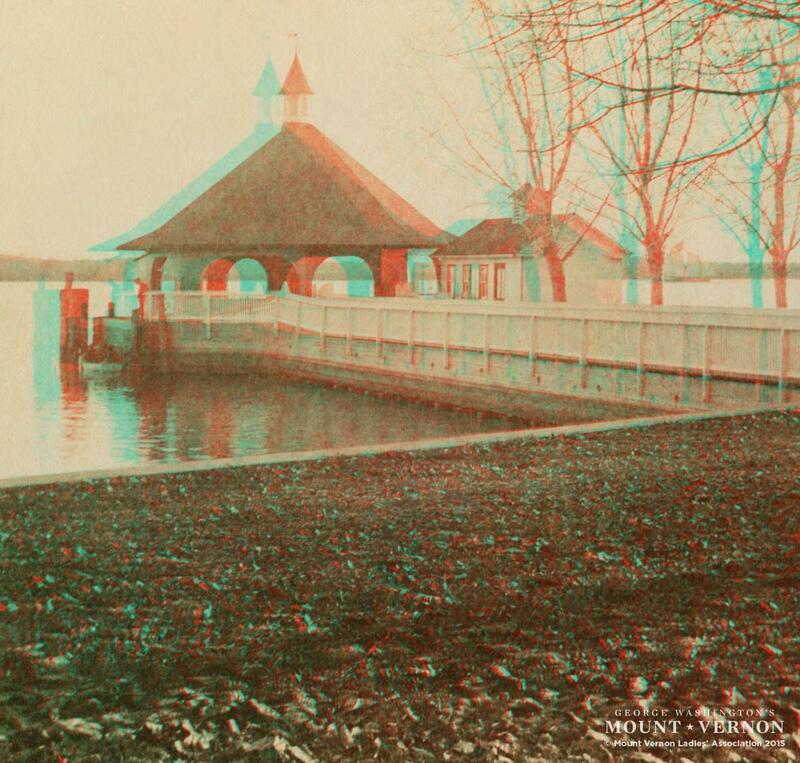 In 1849-1850, John A. Washington III, granted a steamboat line exclusive rights to deliver passengers to the Mount Vernon landing. He began to charge an entrance fee, and as part of the deal, the boat company agreed to lay a plank walk from the wharf to the tomb. In mid-1912, the wharf was completely reconstructed with a concrete foundation and walls. Note the sailing ship on the Potomac River and two men on the left side of the wharf. 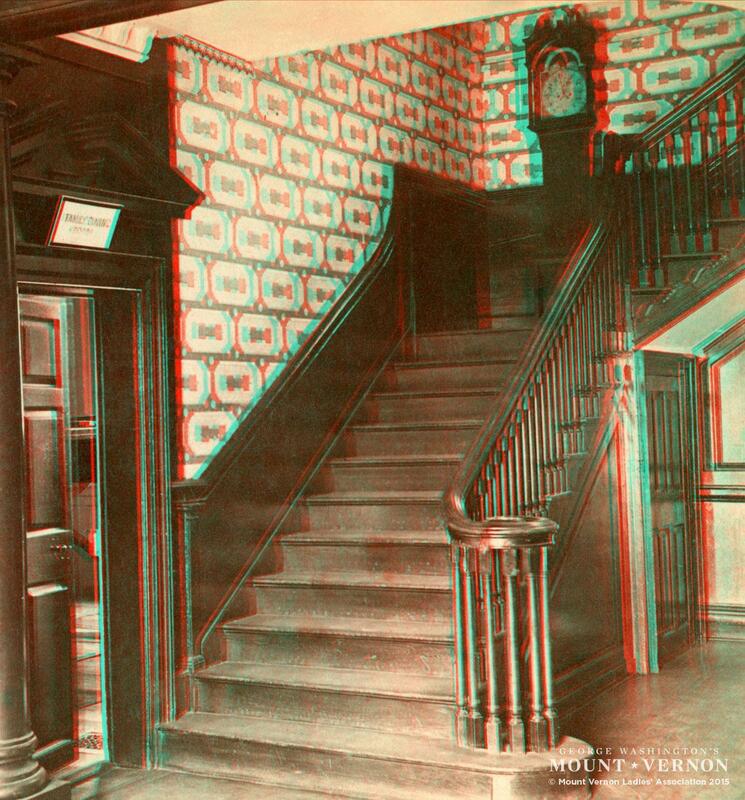 The waiting room, shown on the causeway, was originally constructed in 1885 and renovated in 1891. George Washington’s extensive renovations in 1757-1759 removed a partition that had divided this space into two rooms requiring installation in 1912 of columns to hold up a center support beam as seen on the left. The clock seen on the landing descended in the extended Washington family, but there is no evidence that George Washington owned a tall case clock. In the 1820s Bushrod Washington, the General’s nephew, enlarged the windows shown in the image for access to the porch added on the south side of the Mansion. The windows were restored to their 18th-century form in 1932. After 1858, the room and furnishings of this very important room were given into the care of the Vice Regent for Virginia. 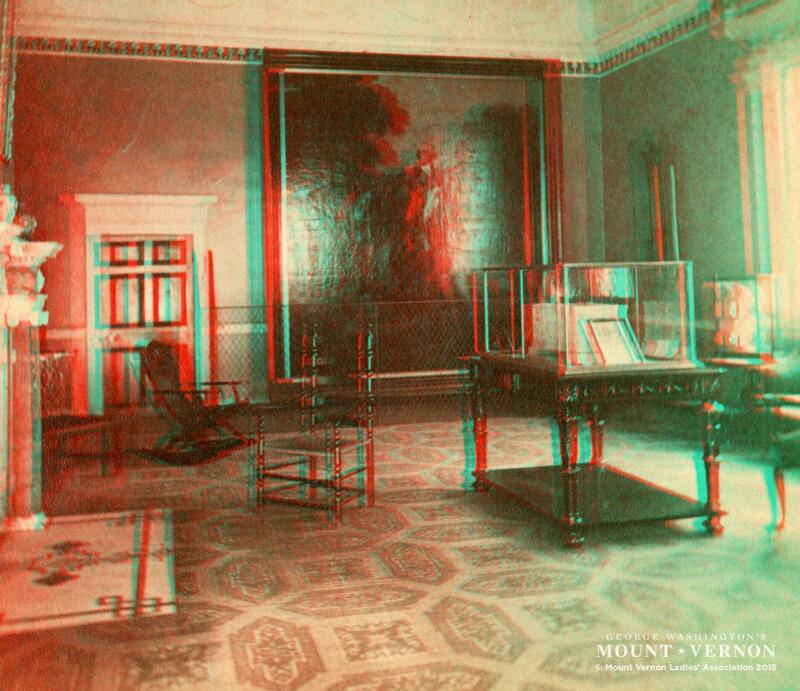 When the Mount Vernon Ladies’ Association opened the property to the public in 1860, they also undertook a series of extensive—and costly—repairs and renovations. It was not long before they saw the opportunity to harness the emerging technology of photography to help showcase the glory of this landmark property. 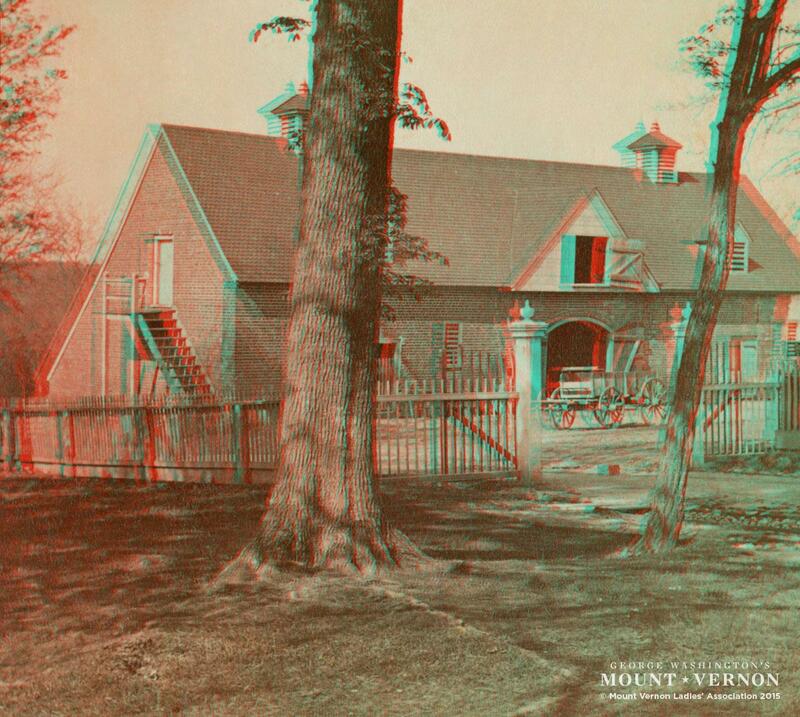 By selling views of Mount Vernon in photographs and stereoviews, the Association could continue to raise funds for the ongoing work of preserving the site. While many people took pictures of Mount Vernon, only these photographers were authorized by the Mount Vernon Ladies' Association. Gardner was born on October 17, 1821 in Paisley, Scotland. In 1856, he and his family, immigrated to the United States and stayed in New York City. Mathew Brady hired him as an operator, along with his brother James, in his New York studio. During this time he introduced the imperial size print, a large print roughly 21 x 17 inches. When the Civil War broke out in 1861, Brady set out to photographically cover the conflict. In 1862 after the battle at Antietam, Gardner along with James Gibson, were the first to photograph the dead on the battlefield. When the photographs of the dead were exhibited at Mathew Brady’s studio in New York City, they caused a sensation. Until that time only paintings and lithograph prints depicted battles and the aftermath, here was the stark reality of war. 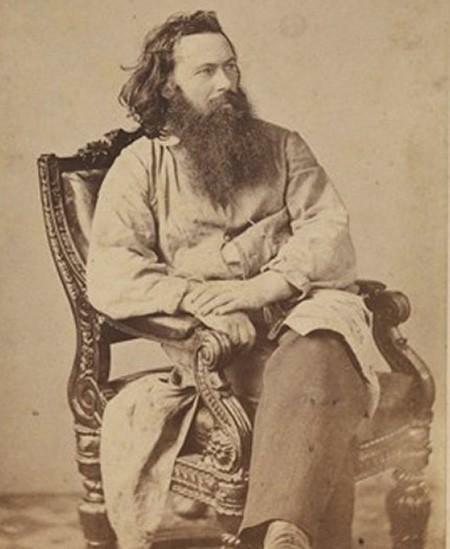 Sometime in 1863 Gardner broke from Brady and opened his own studio in Washington D.C. and brought along several photographers that were in Brady’s employ. The first person he photographed in his new studio was President Lincoln. Gardner photographed the president more times than any other photographer. In 1866 he published a large two volume set of his war photographs. Gardner’s Photographic Sketch Book Of The War contained one hundred large prints, each pasted on a page, along with his descriptive text. 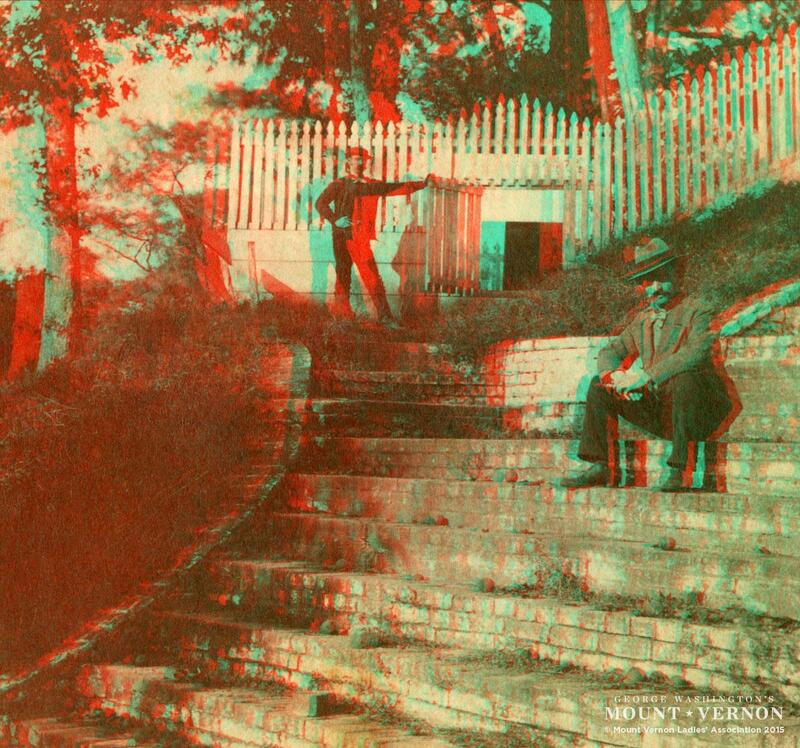 He documented the west ward expansion of the railroad in 1867 and produced more than 150 stereo views and full plate prints of Kansas and the surrounding area. From 1867 to 1878 he was the official photographer of the Ladies’ Mount Vernon Association. Luke Dillon, who operated out of Washington D.C t Pullman's Gallery, 935 Pennsylvania Ave. was a member of the Photographers Association of the District of Columbia. Authorized photographer of the Ladies' Mount Vernon Association from 1884 to 1894. Dillon was born in New York to Irish parents and served in the Civil War as a photographer to the Army of the Potomac. 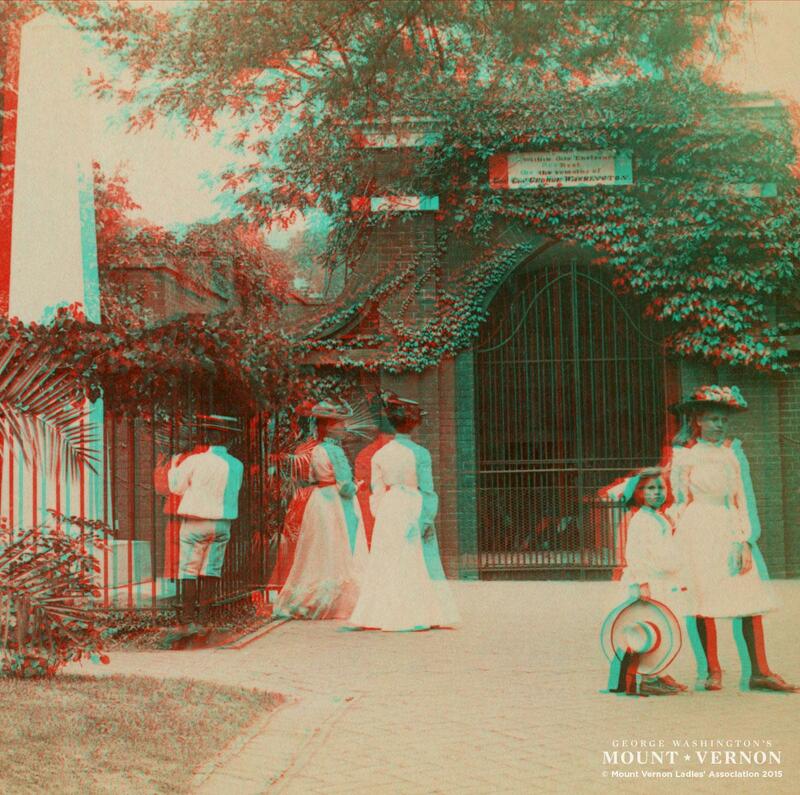 As “Photographer to Mount Vernon” from 1874 through 1897, his duties were to photograph not only rooms at Mount Vernon and the members of the MVLA at their annual meetings but also hundreds of tourists each year. During this time he lived in Washington, D.C., where he maintained a photographic gallery at 935 Pennsylvania Avenue N.W. Johnson operated out of Erie and Corry, Pa. Later in Washington D.C. Known Washington D.C. locations at 317 Pennsylvania Ave., 309 9th St., and 426 7th St. Authorized photographer of the Ladies’ Mount Vernon Association from 1879 to 1883 with some published by James F. Jarvis. From October 21, 1857, until at least August 18, 1858, N.G. Johnson advertised a daguerreotype, mclainotype, and ambrotype gallery and daguerreian stock depot in Iowa City, Iowa. He was located on Washington Street, three door east of the post office. It is unclear is he was identical to Newton G. Johnson, a daguerreian at 177 South Clark Street, corner of Monroe, Chicago, in 1859-60; Washington, D.C., from 1864-1866; Meadville and Erie, Pennsylvania (dates unknown); and 48 Main Street, Corry, Pennsylvania, in 1873-1874. Brothers William and Frederick Langenheim became two of the first successful commercial photographers in America. Both were born in Germany--in 1807 and 1809, respectively--and immigrated to the United States as young men. By the early 1840s, Frederick and his brother had opened a portrait studio in Philadelphia at the Mercantile Exchange. Many prominent Americans, including President John Tyler, sat for them. Frederick operated the camera and produced photographs; William worked as business manager. The brothers initially practiced the daguerreotype process but were induced to purchase the rights to use William Henry Fox Talbot's calotype process. They not only ran a successful portrait studio but also helped pioneer several photographic advancements in the United States: the use of glass negatives and positives to make prints and projections, and the calotype process to make stereo images. They were the first photographers to travel around the United States making and selling popular tourist views. After William's death in 1874, Frederick sold the business. He died five years later. 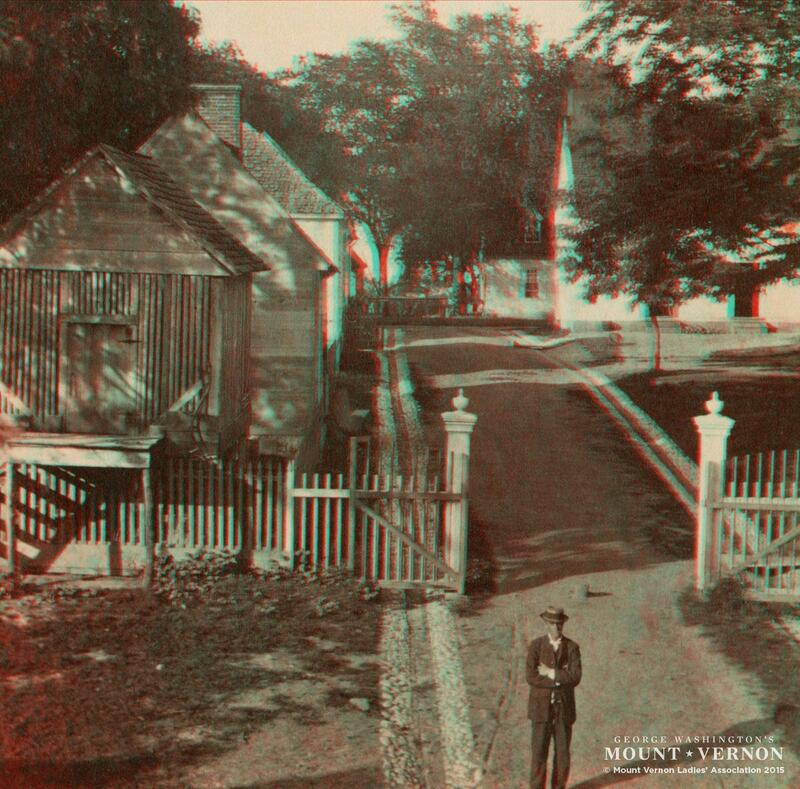 While not official photographers hired by the Mount Vernon Ladies’ Association, the Langenheim brothers were the first to take an image of George Washington’s home.